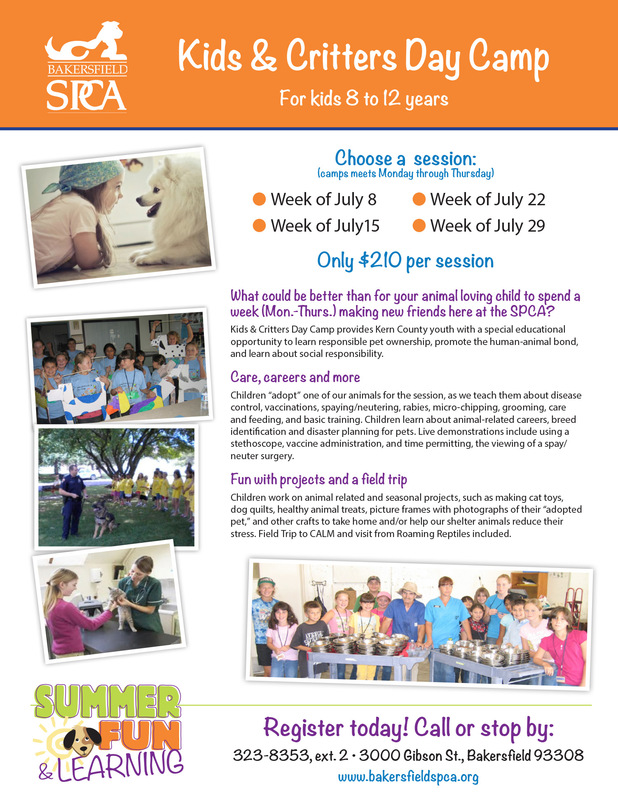 What could be better than for your animal loving child to spend a week (Mon.-Thurs.) making new friends here at the SPCA? Kids & Critters Day Camp provides Kern County youth with a special educational opportunity to learn responsible pet ownership, promote the human-animal bond, and learn about social responsibility. Children “adopt” one of our animals for the session, as we teach them about disease control, vaccinations, spaying/neutering, rabies, micro-chipping, grooming, care and feeding, and basic training. Children learn about animal-related careers, breed identification and disaster planning for pets. Live demonstrations include using a stethoscope, vaccine administration, and time permitting, the viewing of a spay/neuter surgery. Children work on animal related and seasonal projects, such as making cat toys, dog quilts, healthy animal treats, picture frames with photographs of their “adopted pet,” and other crafts to take home and/or help our shelter animals reduce their stress. Field Trip to CALM and visit from Roaming Reptiles included.